What is Islam and What makes one a complete Muslim. Islam is attainment of peace through submission to Allah. There are five pillars of Islam which form the base foundation of Islam and one who follows it makes a complete Muslim. There is no god worthy of worship except God and Muhammad is His messenger. This declaration of faith is called the Shahada, a simple formula which all the faithful pronounce. ilaha (god) can refer to anything which we may be tempted to put in place of God - wealth, power, and the like. Then comes illa Llah: 'except God', the source of all Creation. A message of guidance has come through a man like ourselves. Prayers are said at dawn, noon, mid-afternoon, sunset and nightfall, and thus determine the rhythm of the entire day. Although it is preferable to worship together in a mosque, a Muslim may pray almost anywhere, such as in fields, offices, factories and universities. Visitors to the Muslim world are struck by the centrality of prayers in daily life. God is most great. God is most great. Come to success (in this life and the Hereafter)! There is no god except God. One of the most important principles of Islam is that all things belong to God, and that wealth is therefore held by human beings in trust. The word zakat means both 'purification' and 'growth'. Our possessions are purified by setting aside a proportion for those in need, and, like the pruning of plants, this cutting back balances and encourages new growth. Every year in the month of Ramadan, all Muslims fast from first light until sundown, abstaining from food, drink, and sexual relations. Those who are sick, elderly, or on a journey, and women who are pregnant or nursing are permitted to break the fast and make up an equal number of days later in the year. If they are physically unable to do this, they must feed a needy person for every day missed. Children begin to fast (and to observe the prayer) from puberty, although many start earlier. The annual pilgrimage to Makkah - the Hajj - is an obligation only for those who are physically and financially able to perform it. Nevertheless, about two million people go to Makkah each year from every corner of the globe providing a unique opportunity for those of different nations to meet one another. Although Makkah is always filled with visitors, the annual Hajj begins in the twelfth month of the Islamic year (which is lunar, not solar, so that Hajj and Ramadan fall sometimes in summer, sometimes in winter). Pilgrims wear special clothes: simple garments which strip away distinctions of class and culture, so that all stand equal before God. On reaching Quba, Rasoolullah Sallallahu 'Alayhi Wasallam had a Mosque constructed. The Mosque was named ‘Musjid-e-Quba’. This Mosque was renovated on numerous occasions over numerous periods of time. They reached Quba on the 8th of Rabi-ul-Awwal 13 Nabawi and remained there for fourteen days. In 435 Hijri Abu Ya’la constructed the Mehraab (Pulpit) in the Mosque. In 881 Hijri Qaatiba, the Egyptian King renovated it and rebuilt the Mehraab and Mimbar. In 1245 Hijri Sultan Mahmood Thaani Uthmani extended the Mosque giving it a face-lift. A further renovation was also done by the Turks in 1389 Hijri and then further extensions continued. 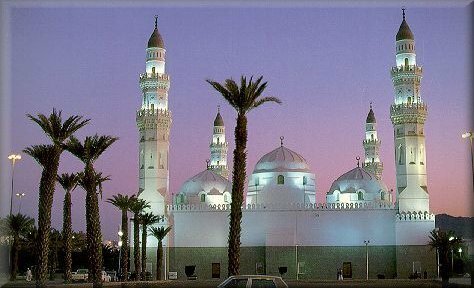 Rasoolullah Sallallahu 'Alayhi Wasallam arrived in Madinah Munawwarah on a Monday, the22nd of Rabi-ul-Awwal from Quba. Rasoolullah Sallallahu 'Alayhi Wasallam made his Hijrat (migration) whilst riding on a camel called Qiswa. In the same year, from the 16 July 622 C.E. the beginning of the Hijri Calendar commenced, but it was only officially introduced during the era of Hazrat Umar-e-Farouk radhiallahu anhu on a Thursday, the 3rd of Jamadis Thaani 17 Hijri. SAYYIDUNA ABU BAKR AL-SIDDIQ IS FIRST ::..
» First man to accept Islam. » First companion to publicize his Islam. » First companion to preach Islam and bring the likes of the 10 promised Jannah to Islam excluding Sayyiuna Umar and Sayyiduna Ali (Allah is well pleased with them). » First companion to migrate to Madinah Tayyibah. » First companion to buy the land of a Masjid (Masjid Nabawi). » First and always the first to support and help the Beloved of Allah Almighty (upon him peace and blessings). » First and only companion to lead Muslims in prayer on the Beloved Prophet's instruction (upon him peace and blessings) during his life. » First and only companion to sacrifice *all* of his wealth in the way of Islam (esp for the battle of Tabuk). » First companion that always understood the hidden secrets and indications in the Beloved Prophet's speech (upon him peace and blessings) before anyone else. » First Caliph (successor) of Islam. » First Caliph to have been appointed whilst his father (Uthman, Abu Quhafah) was still alive. » First Caliph to have complied the Noble Quran in a single book. » First Caliph to have called the Quran a "Mus'haf". » First Caliph to have conquered the Persians in Iraq and Romans in Sham. » First Caliph to create the Muslim treasury (Baytul Maal). » First Caliph to have his salary fixed by public opinion (by Abu ubaydah al-Ameen and Sayyiduna Umar). » First Caliph to defend the belief of the Finality of Prophethood (Khatm e Nabuwwat) by defeating the false Prophet of Yamamah, Musaylamah Kaddhab. » First and only known companion to pass away on the same day (Monday) as the Beloved Prophet (upon him peace and blessings) and at the same age (63 years). » First companion to be buried next to the Beloved Prophet (upon him peace and blessings) in the house of his own daughter Sayyidah Aishah (may Allah be well pleased with her). » First companion to rise from his grave with the Beloved Prophet (upon him peace and blessings) on Judgement Day hand in hand. » First man to enter paradise when every door will desire for him to walk through it calling him proclaiming "welcome welcome". » First and only companion that will see Allah Almighty on the day of judgement in a unique manner to everyone else (without shape or form). » First and only Caliph who was titled "The Caliph of Rasulullah" (all others were called "Ameerul Mu'mineen")! » First and only one called a "Companion" (Sahib) in the Noble Quran. Allah Almighty is well pleased with him! Juma ka din hum Musalmano ke liye EID jaisa darja rakhta hai. Juma ke din ki hui ek neki ka ajr 70 guna badh kar milta hai. Aur ek burai ka Gunah bhi 70 gunah badh kar milta hai. 1. Juma ko gusal zaroor kare. Huzur saw ne farmaya"Jis shakhs ne JUMA ko (paak hone ke bawjood sirf sawaab ki niyat se) gusal kiya to uske agle pichle sab gunah maaf ho jate hain "Ek dusri hadees me hain ki "Juma ka Gusal baalo ki jadon me se bhi Gunaho ko bhi nikal phekta hai"
2. Juma ko Kasrat se Durood padhe. Kyunki Juma ko farishto ki ek jamaat sirf isi kaam me hoti hai ki Huzur saw per padha jane wala DUROOD aap ke paas pahuchati hai. Sabse afzal DURROD IBRAHIM hai. 3. JUMA ko SALAAT-ut-TASBEEH ki namaz bhi padhe. Huzur saw ne farmaya ki "Ye namaz jo padhta hai uske agle-pichle, chote-bade, jaan bijh kar kiye hue aur anjane me kiye hue, sageera aur kabeera, sab Gunah maaf ho jate hain." Aur JUMA ko sab amal ka sawaab 70 guna badh kar milta hai to is ki Fazeelat aur badh jati hai. 4. JUMA ko ASR ki namaz ke baad jo shaks ye DUROOD 80 padhega "ALLAHUMMA SALLI ALAA MUHAMMADIN NABIYIL UMMIYEE WA ALAA AALIHI WASALLIM TASLEEMA" to uske 80 saal ke Gunah maaf honge aur 80 saal ki Ibadat uske aamaal-naame me likhi jaegi. 5. JUMA ko SURA KAHF padhe, Huzur saw ne farmaya "Jo shakhs Juma ko Sura Kahf padhega to agle hafte tak uske saath ek noor rahega jo KAABE tak pahuchta hoga aur agar is dauran DAJJAL nikal aaya to uske fitne se mahfooz rahega" Ek dusri Hadees me hai ki "Jo shakhs JUMA ko SURA KAHF padhega to agle hafte tak ke uske Gunaho ka kaffara ho jaega"
ALLAH hum sab ko tofiq de aur zyada se zyada DEEN ki mehnat karne wala banaye. There are seven conditions for a salaat to be corrected.